The recent attack led by Buddhist monks on the Khairya Jumma mosque located in the so-called “sacred zone” of the Dambulla rock temple in the central province is important even though it did not develop into a larger scale clash between the Buddhist and Muslim communities of Sri Lanka. The Dambulla Khairya Jummah mosque had been in existence for over 60 years and the mosque trustees have legal documents regarding its construction. On Friday the 20th of April 2012 a tense situation arose as regular Friday prayer at the mosque was prevented by a gang led by Buddhist monks who claimed that it was an illegal construction built on sacred Buddhist ground. Many view this incident as an isolated event led by a group of extremists; an event which was easily quelled as it did not represent the sentiments of the majority Buddhist populace. Although this may be true, this line of thinking conceals some of the realities of the inter-religious relations in Sri Lanka within which the Dambulla incident could be located. In this short piece, I attempt to highlight existing problems in the religious setting in the Sinhala-Buddhist south of Sri Lanka giving special attention to the Dambulla incident. In my view the Dambulla incident is only one such occurrence among many attacks on non-Buddhist religious spaces by Buddhist elements. Most of these incidents remain unknown to the general public as they are not widely reported given the obvious biases of the mainstream media. For example, in the recent past, there was a series of attacks on more recently established churches belonging to various Christian denominations in Sri Lanka. It was quite obvious that these attacks were well organised. 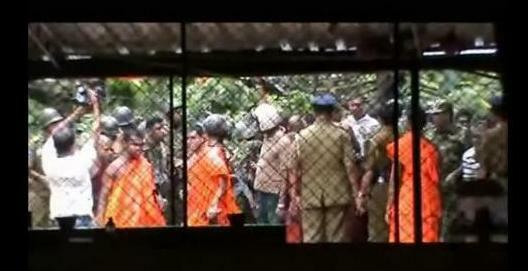 There were also other occasional incidents where clashes took place between Buddhist and other religious communities. These apparently isolated occurrences can very well be located in the context of the “Buddhist revival” that has been underway in the last decade and half in Sri Lanka. This “revival” goes hand in hand with two significant phenomena. First, the formation of several new middle class social layers in the fast expanding Colombo suburban belt and many regional towns. Second, the upsurge of extreme Sinhala Buddhist nationalism that is very well supported by members of these new social layers. Both these phenomena are a direct outcome of the expansion of the capitalist economy in the last few decades in Sri Lanka. Clearly the two elements of this statement are mutually contradictory. On the one hand, it appears as if it celebrates peaceful religious co-existence because “Jāti āgam bēda näti” is the standard and official parlance with which ethnic and religious diversity is acknowledged. These words are always uttered by politicians and other public figures in their public speeches. The other part of the statement carries exactly the opposite meaning. This, I propose, symbolises the contradictory nature of the majority Sinhala Buddhist mindset towards religious diversity within the island. This paradox became clearly visible in the events that took place around the Dambulla incident. The Mahinda Rajapaksa regime, while accommodating almost every group of ultra Sinhala Buddhist nationalist elements, nurtures a strategically important political alliance with the Muslims. This alliance is more important for the regime internationally than locally, as Muslim countries constitute a major source of support in international fora, especially in the context of growing tensions between Sri Lanka and the Western Bloc. The last thing that the regime can afford at this juncture is to offend its international Muslim allies over sensitive religious issues. It is important to keep in mind that Iran issued a carefully worded statement immediately after the incident expressing its concern over the Dambulla incident, announcing that the government of Iran was hopeful that the Sri Lankan government would take measures to quell religious tensions. It is likely that the regime changed its initial response to the event which mainly aimed at pleasing anti-Muslim elements. Beneath the tactical alliance between Muslim politicians and the mainstream Sinhala Buddhist political elite, there are serious fault lines in the relationship between Muslims and Sinhala Buddhists. Sinhala Buddhist nationalism generally perceives Muslims to be a grave threat. This sentiment was clearly articulated during the early phase of the present wave of the Buddhist revival by the popular monk Gangodavila Soma whose mysterious death, while travelling in Russia in late 2003, was attributed to an international anti-Buddhist conspiracy. His anti-Muslim outcry even provoked late M. H. M. Ashraff, an influential Muslim politician at that time, to counter him in a live debate on television, which many believed was a setback for the popular Buddhist monk. Most importantly, at that juncture, neither of the two major political parties directly supported Soma’s aggressive campaign which was potentially dangerous for the peaceful coexistence of different religious groups in Sri Lanka. A trademark feature of this push towards Buddhist supremacy is the invasion of public spaces by raising permanent religious constructions and holding innumerable religious rituals at public places. These activities are supported by the state, local politicians and most importantly the new business elite. This Buddhist revival has reached new frontiers in the post-war North and East, predominantly Hindu and Muslim provinces, where Buddhist activities are facilitated through the active support of the military, mass participation of southern Sinhala Buddhist pilgrims to the North and political support of groups such as the JHU. This emergence of a competing religious space is being cautiously viewed by non-Sinhala Buddhist sections of the post-war North and East.